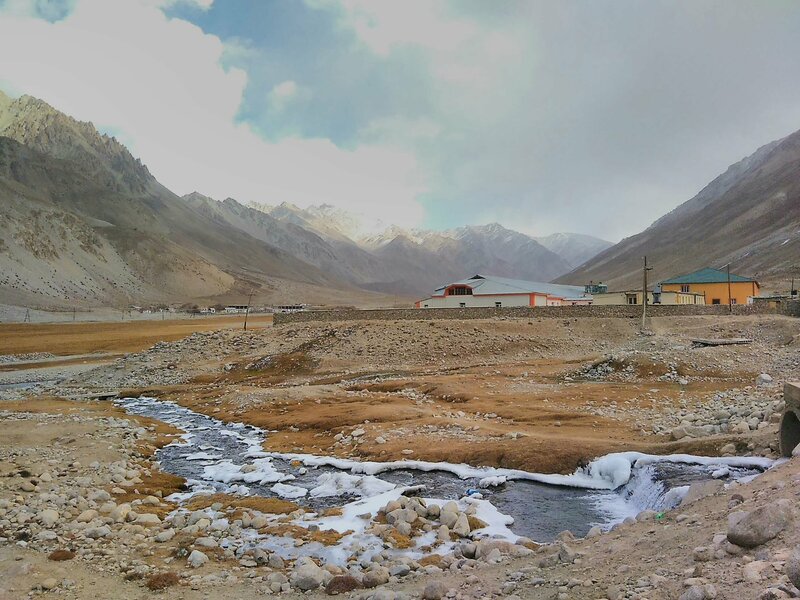 We woke up the next morning with the full on, eleven-bells flu that had been tearing its way through guests at the little hostel halfway along the Pamir Highway. We tried everything: bed rest, honey and lemon, honey and lemon and vodka, and just vodka, but nothing would shake it. Hours after we’d managed to navigate the sheer climbs and transient road surfaces of the ride between Dushanbe and Khorog, we were stuck under duvets, watching episodes of Arrested Development, trying to summon the energy to order greasy pizzas from Khorog Fried Chicken, and watching anxiously as October edged towards November and the forecast highs of temperatures on the Pamir Plateau dropped below freezing. 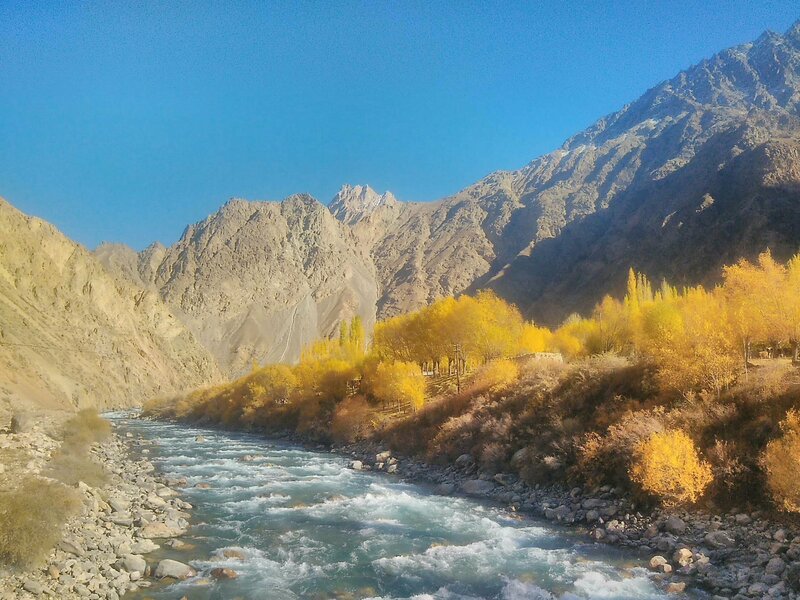 Eventually cabin fever won out over common sense and, still wheezing, shivering and hacking coughs we left Khorog on the steep road that crossed out of the Panj River Valley and into the Gunt River Valley. We wound a short, difficult day through its pretty farmsteads and streams before setting up camp on a plateau in a gravel pit, our first sub-zero night in the tents. That day Miranda pushed for a brave few kilometres before calling a halt, ground down by a combination of no sleep and flu. She decided to hitch the next leg, to the hot springs at the small town of Jelondy. But whatever stomach bug I was currently enjoying made me feel queasy when I stopped moving, so I decided to ride on. “Pick me up!” I shouted back to Miranda, doubting myself until I swept down along a mirror-clear reservoir and into a valley ablaze with an Autumn I don’t have the vocabulary to describe. 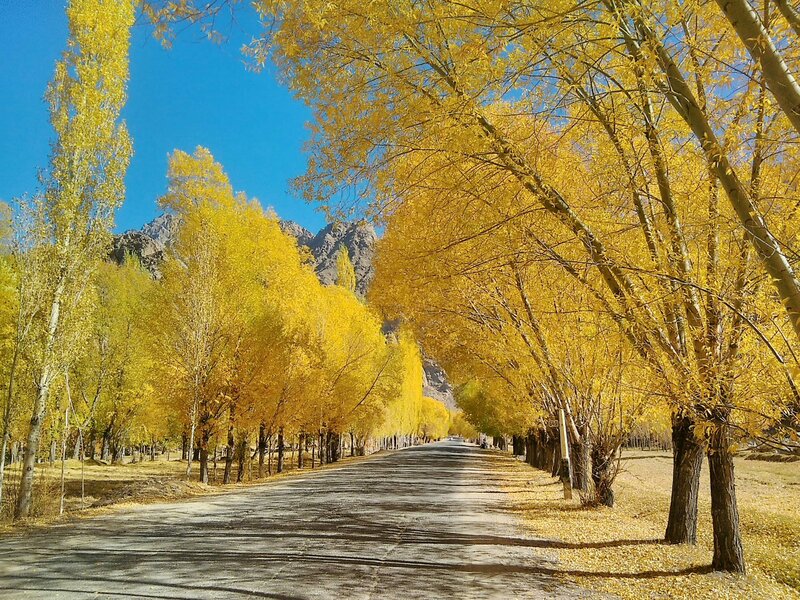 Riders who passed through that valley in the entirely more sensible month of September had told us the trees looked spectacular: but really, they were consumed by a kind of yellow that I didn’t think existed in nature, lively against a blue high-altitude sky between the first snow-capped peaks. I thought: there’s nowhere I would rather be. We arrived in Jelondy late at night, and it was well below freezing. At the gloriously Soviet-era, slightly dilapidated, hot springs hotel we sat in the bone-loosening warmth of the sulphurous hot water, as freezing mountain night air drifted in from one of the shattered panes in the skylight, and thought we had finally bested the Pamir Highway. Then Miranda got a headache. We hadn’t put a lot of thought into altitude sickness ahead of the ride. I had been to 2800m on a trip to China with no ill effect and no one else we knew had suffered much beyond a minor headache and a bit of breathlessness. Now we were at 3600m, very high altitude, and the road was due to climb up to 4200m the next day, then descend, before rising up again to 4677m before finally tumbling down to Osh. 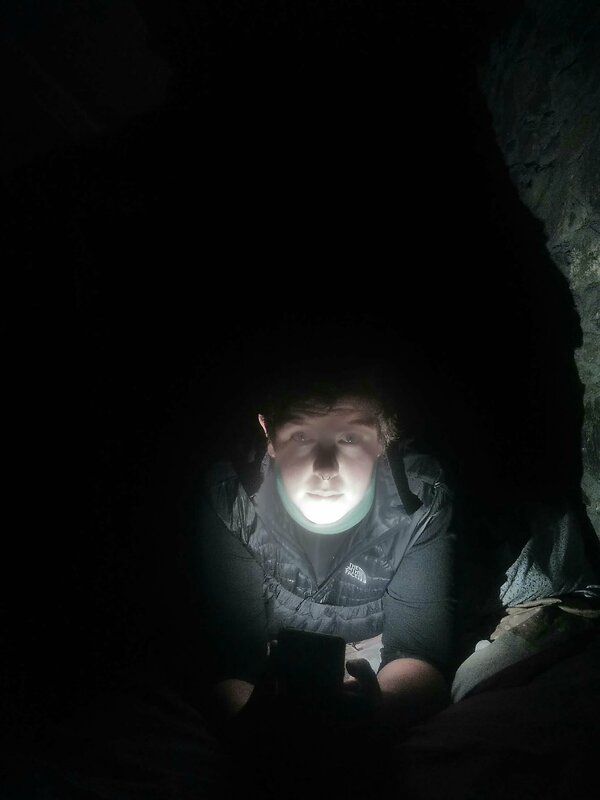 The next fortnight was all due to be at very high altitude, so I looked on with horror as Miranda’s headache got steadily worse, expanding into a migraine with nosebleeds. As she sat in our darkened room, with sunglasses on to blunt the remaining light and a scarf tied tightly around her head to try and squeeze away the pain, I had a tense conversation with a couple from home who are experienced off-piste ski tourers. One is also a doctor. “Going on higher in a taxi could kill her,” she told me. The next day the man who ran the hotel – wearing, suitably, a t-shirt that said “today I am the hero” – drove us to the doctor’s surgery in Jelondy, a sparse concrete hut where a woman took Miranda’s blood pressure and gave her a sachet of tablets. “Take these and rest, and you will be OK to move on,” she was advised. I didn’t have much time to reflect on the awful implications of this last remark as the road reared up soon after Jelondy, and I discovered what cycling at high altitude really feels like. I reached the pass after a soul-destroying final kilometer of 100m bursts of effort between episodes of hyperventilation. Stopping long enough to take a summit selfie, I got back on the bike and wondered where Miranda was. It was 3pm, and there wasn’t much point hanging around as my core temperature dropped, so I set off across the plateau, adding layers as the sun started to drop behind the mountains. By half past four the sun and my blood sugar had both extinguished and I found myself standing on the side of the road in a bitter wind watching the last of the light tuck behind the mountain ridges. I hadn’t eaten since about 9am, when I had half a bowl of muesli. I was holding a pack of instant noodles, but the gas in my lighter was too cold to light the stove. I studied my packet of emergency matches for a long time, trying to drum up a memory of how to use matches, and realised with sudden panic that I needed to warm up, fast. Convinced some disaster had befallen Miranda I half constructed my tent at the side of the road and crawled into my sleeping bag. I was woken from a daze by the sound of a car and an extremely worried, “LIZ!” Between bundling me into the car and collecting the possessions I’d strewn across the plateau Miranda explained that her original taxi had cancelled, and she’d had to scramble to get another one to collect her from Khorog, 200km away, at 4pm. I defrosted on the short ride to Alichur, where we fell gratefully into a warm homestay and looked forward to the next day’s ride across the plateau. To my surprise, I reached the 4000m pass and the start of the descent into Murgab by midday, having covered about 40km in a couple of hours. But I was tired. The wind was icy and the scenery, while beautiful, felt austere and lonely. I looked at my phone: back in the last window of cell signal, I’d had a message from Miranda: overcome by nausea, she’d had to get out of the taxi, and had dropped her jacket, containing her wallet, at the side of the road. She was in Murgab, and had no way to pay the driver. I stood on the pedals and pushed into a bitter wind that rounded the bends on the descent. Before we’d left the homestay Miranda, who knows that when I’ve got my eyes on a prize I forget to eat, convinced me to take a couple of squares of the stale bread left over from breakfast. I ate one for lunch, one handed, steering around potholes with the other hand. It took me six hours in total to ride to Murgab, probably the fastest 100km I’ve ever done. 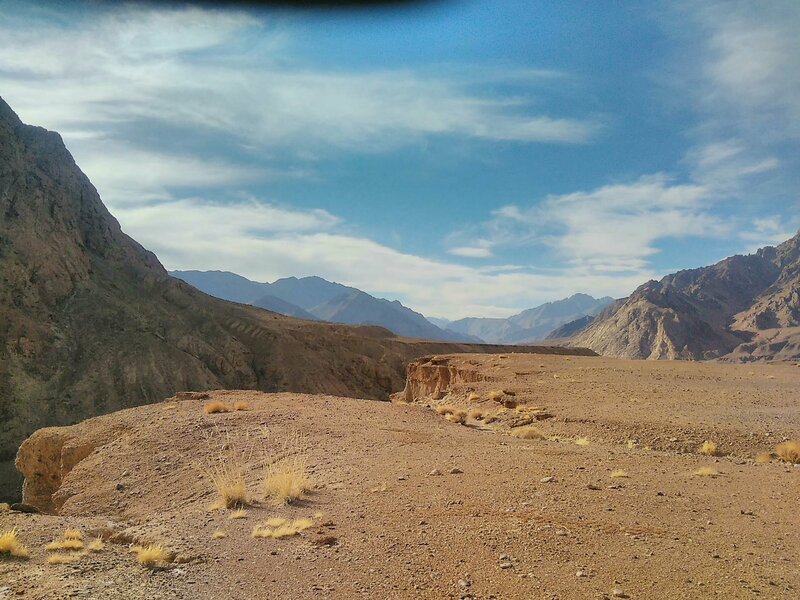 I arrived to good news – a Tajik family had rescued Miranda’s jacket and restored it to her – and more bad news: on Miranda’s arrival the homestay owner had taken her to the only hospital in the Pamirs, where they’d given her aspirin, paracetamol, and more bloody Valerian. There was no question: Miranda had to get down to a normal altitude as soon as possible. I looked at the road ahead and agonised about what to do next. 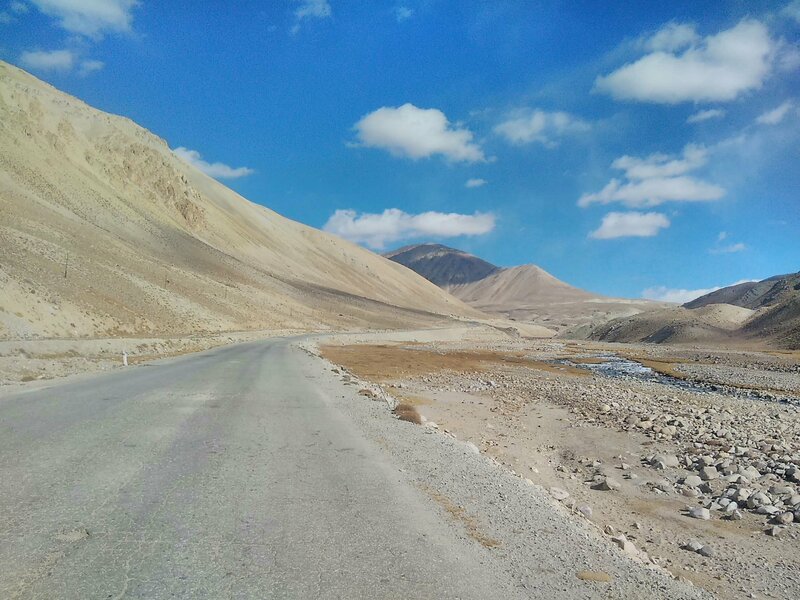 I was at the foot of Ak Baital pass, the biggest challenge on the Pamir Highway at 4655m, and I was feeling confident I could do it. But between me and the pass were 80km of frozen wilderness, and between the pass and a reasonable altitude another 200km of the same. How would I cope camping alone in the -20 winter nights Ak Baital was famed for? Was it safe? Locals spun stories of recent wolf attacks, on livestock and villagers. But besides that, who would I celebrate with on the mountain’s top? 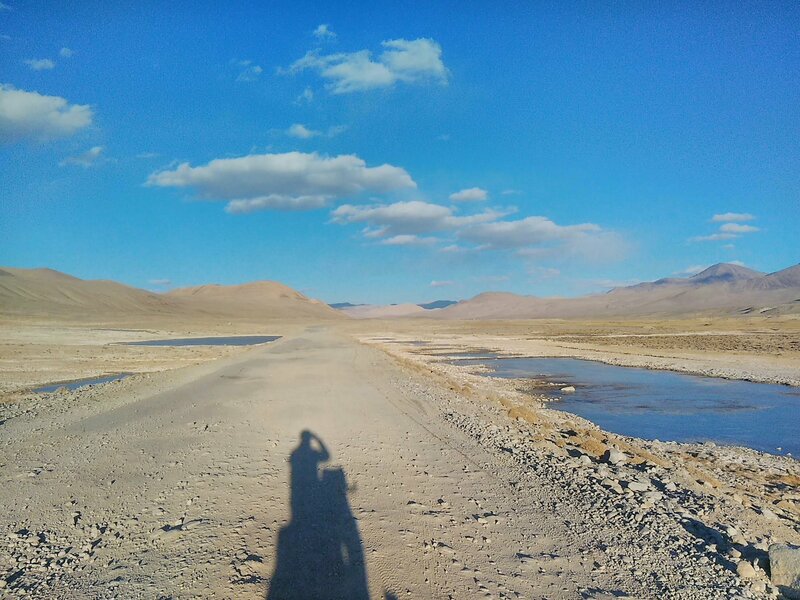 Was it worth the arduous ride to spend a night by the stunning Lake Karakol – alone? 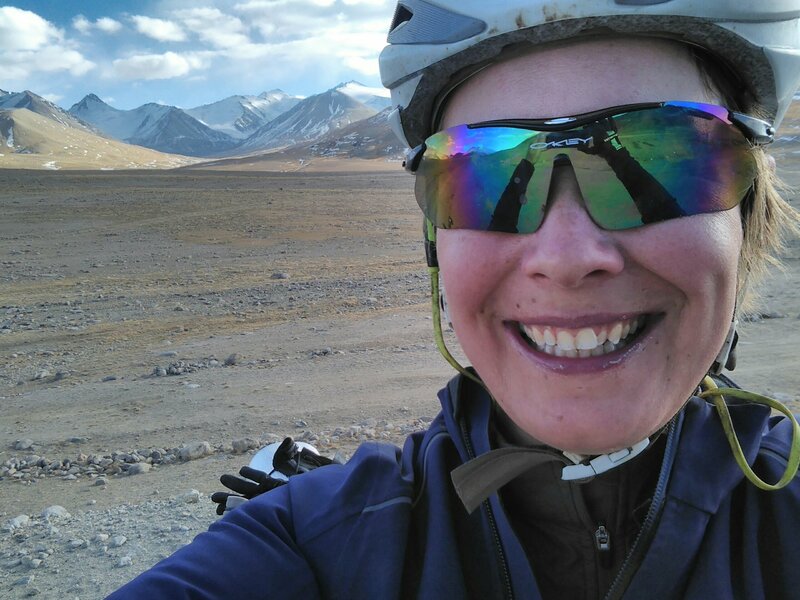 Miranda had been looking forward to the lake – now out of reach at 3900m high – since we’d begun the Pamir Highway. And I thought, we do this together, or not at all. 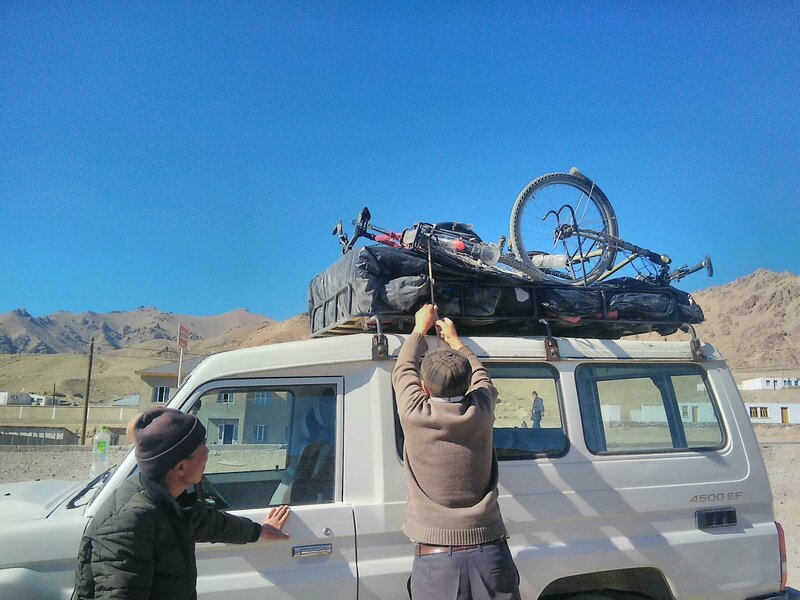 The next day we both loaded our bicycles precariously onto a mini-van and set off for the end of the Pamir Highway at Osh, with a stop at the Kyrgyzstan village of Sary Tash. On one level, it was heartbreaking to have come so far and then have to speed through the last of the awesome scenery in a car. 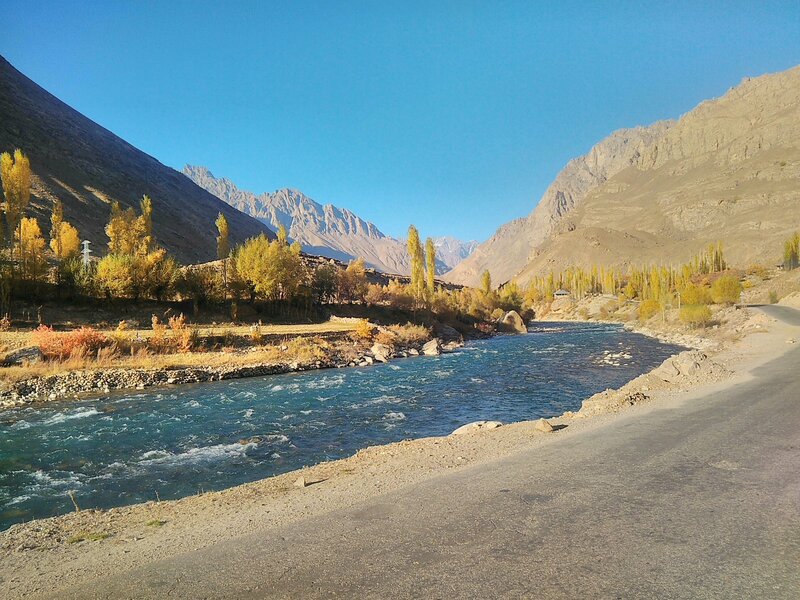 But early on in the journey we picked up an effervescent Russian hitchhiker called Sacia; and the rambunctious Tajik driver cranked the local radio station up to maximum, and we rattled past Lake Karakol in our very own, high-spirited party bus. 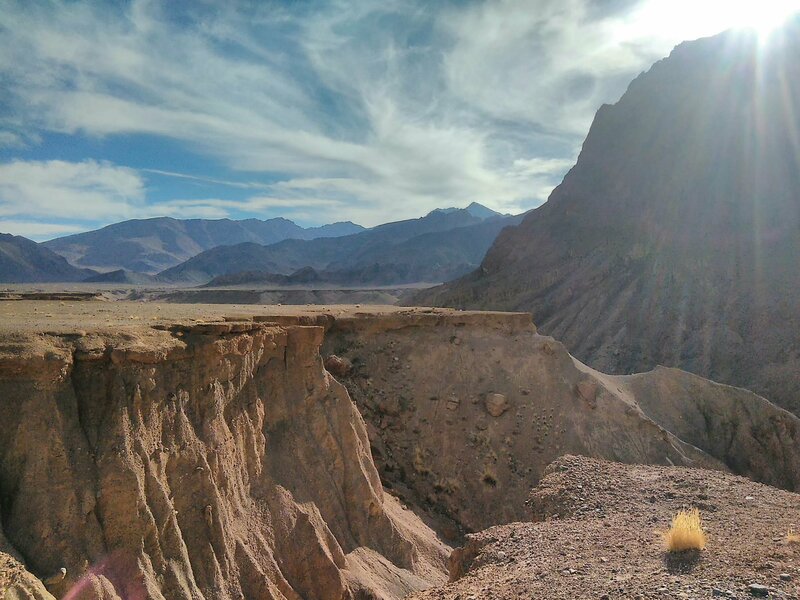 It was nighttime when we edged cautiously through the ghostly kilometres of no-man’s land between Kyrgyzstan and Tajikistan, and a full moon rose and drowned the snowy mountain tops in silver light. It was a sight we’d never have seen on the bicycles. 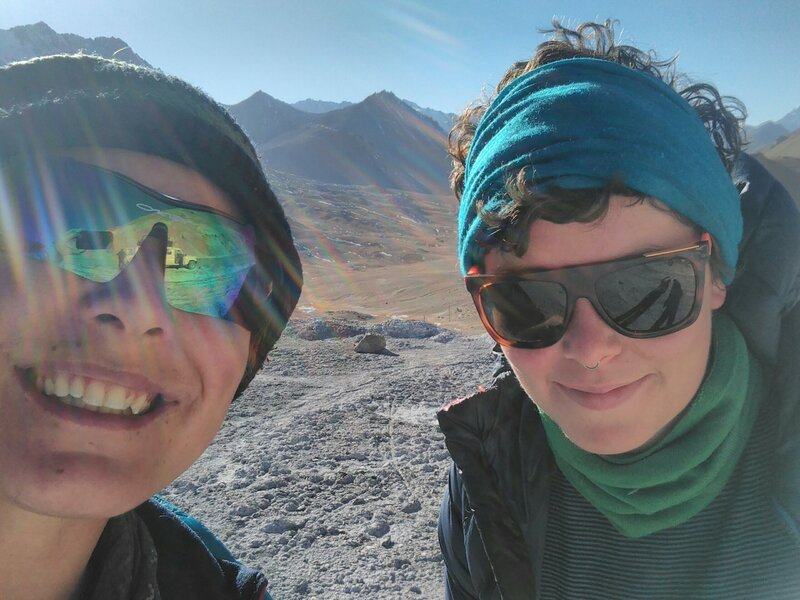 We nosed around Sary Tash and rested up – or, in my case, cycled over the 3500m pass outside town twice because I have FOMO – before starting the last leg of the journey, down to Osh, the end of the Pamir Highway, and our friends Chris and Dea. As we drove down into the Gulcha river valley I looked back: a range of snow and ice, the mountains had closed ranks behind us, and behind that wall was everything – the moonscape deserts outside Dushanbe, a peaceful fortnight along the Afghan border, friends we had made in Khorog, the dreadful onset of altitude sickness, the hot springs, ice-cold lonely climbs, thatched huts, snow drifts and frozen waterpipes. 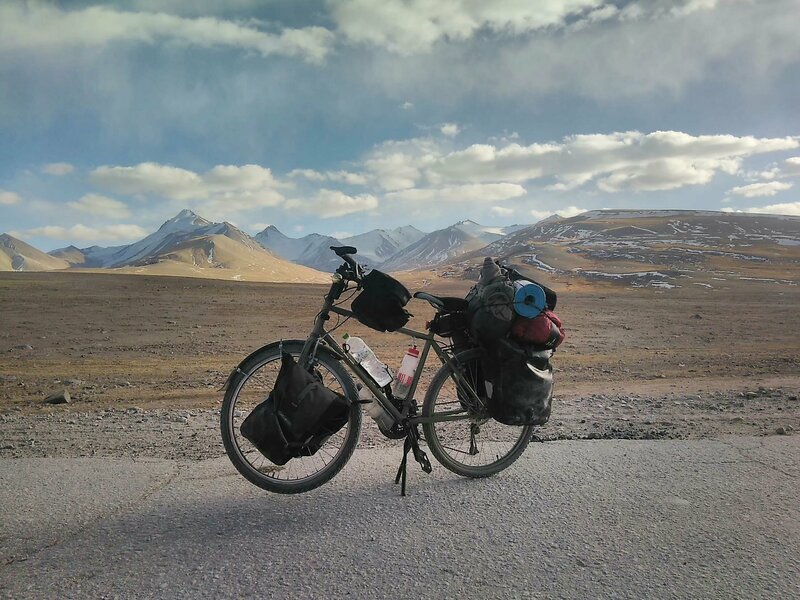 More than I had ever anticipated, the Pamir Highway had taken its toll. But – by every means necessary – we had made it up and over. Gobsmacked. Sounds amazingly and amazingly dangerous! Take care!! Well done. It is certainly a different part of the world than most people will encounter. You are inspiring me to ride it.